Police storm prison in Natal Sunday morning after a 13-hour standoff which has left at least ten dead and dozens injured. SÃO PAULO, BRAZIL – With armored vehicles and a helicopter hovering above prison grounds, Brazilian police forces stormed the Natal State Penitentiary of Alcaçuz in Rio Grande do Norte early Sunday morning, trying to put an end to a 13-hour standoff that left at least ten inmates dead, according to state authorities. 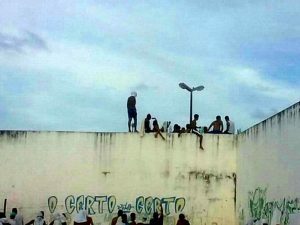 Prison riot in the state of Natal leaves at least ten dead, photo Divulgação/PM. “The rebellion began around 5PM, it started from a fight between prisoners in Pavilions 4 and 5 and is restricted to the two pavilions. Information is being collected about the involvement of criminal factions. Police are working at the scene to end the rebellion,” announced a press release from the state’s Security Department early on Sunday morning. As police vehicles passed through the gates of the penitentiary, reporters outside the prison said that many family members who have been camping out all night seeking information about loved ones cheered and booed officers. Local TV crews stationed outside the prison walls reported it was possible to see black smoke coming out of the pavilions and hear bombs outside the penitentiary. They also noted that the inmates who apparently spent the night on the rooftops had descended from the top of the buildings. There have also been reports that inmates not involved in the feud between criminal groups within the prison are waving white cloths through steel bars, calling for help. Authorities also reported that no inmates escaped the facility. Rio Grande do Norte Governor, Robinson Faria, confirmed he contacted Brazil’s Justice Minister, Alexandre de Morais and requested reinforcement of the National Force outside the prison. According to state authorities, the request has been authorized, but there is no information as to how quickly federal forces will be able to arrive in Natal. Correction: The article has been corrected since it was originally published on January 15th to state that Natal is the capital of Rio Grande do Norte. Brazilian prisons are a perfect model of social diversity. We need more social diversity here in the U.S. so we can enjoy the same results.